I am very excited to have started this commission as I really miss working with my watercolors. There are just not enough hours in the day (or is it energy in the body?) to play with all the mediums that I want to play with each day! 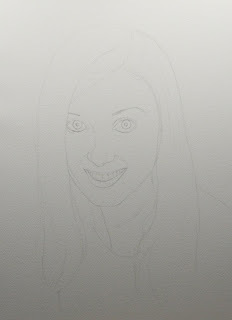 This is the rough sketch which has been transferred to the pre-stretched watercolor paper. Normally I would lighten the lines more with my kneaded eraser but as this monochromatic watercolor portrait will be in black and white I don't need to worry about it as much. I can still lighten areas of the graphite after the watercolor is applied but most of it will either just melt away with the water and settle into the paper. The sketch that I am working from is ridiculously small but due to her features being very clear in most of the areas I am able to get away with it. 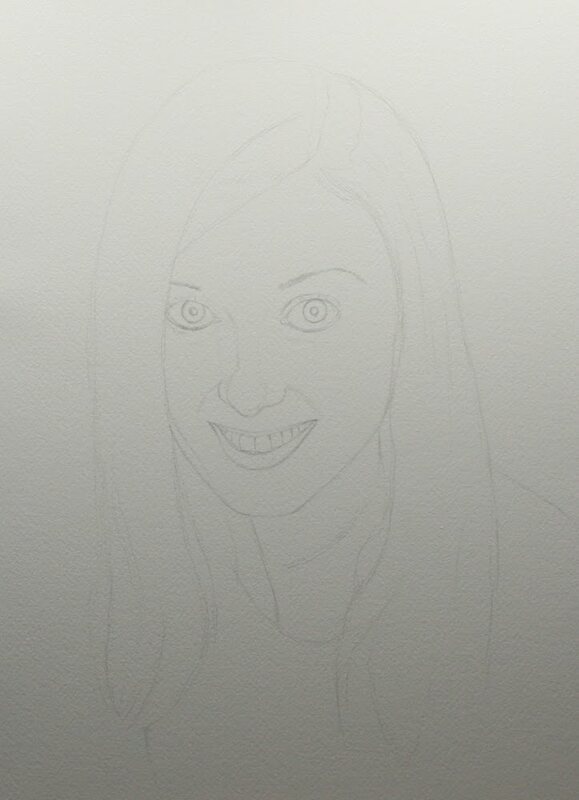 The subject has huge blue eyes and dark blackish brown hair which will look really nice with the black and white monochromatic watercolors that I use. I never use black straight from the tube and prefer to mix my blacks either using the primaries or a blue and earth color depending on the look I am after. Due to the mixing of the pigments the portrait may look more blue or more purple at various stages but will be a gray once completed with cooler and warmer areas to push and pull her features.